I sit in a quiet house and despite its physical absence I hear the ticking of a clock. 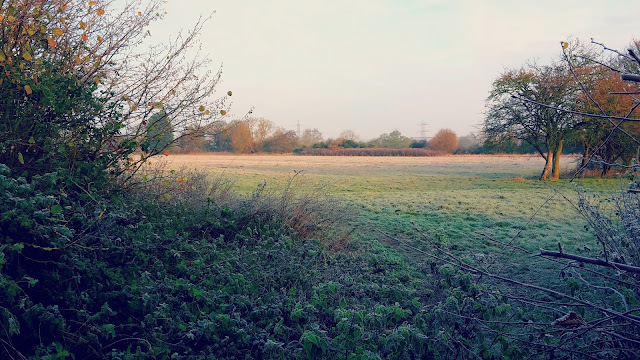 I walk past a frosty field seeing the shift of time from Autumn to Winter. I stand in my girl's room and remember a heavily pregnant me sitting, pausing and wondering how much my life was about to change . I watch my boy sleeping in the exact same position he did as a baby and am transported back to cots and babygros. I spot my girl cosy in the armchair; headphones plugged in, laptop on and recall her sat on my lap; nursery rhymes playing and picture books being read. I watch them both leave me at the school gate and remember how they used to need me to walk them in to their classrooms. I listen as my girl confidently explains subordinate clauses and remember her Jolly Phonics home learning drawing pictures beginning with 's'. I listen to my boy's teachers tell me how he confidently speaks to the whole of the class and recall a boy who would clam up every time it was his turn for show and tell. I see my girl brushing her own hair and tying it up ready for school not needing any of my assistance. I inwardly cry as my boy shakes my arm off as we walk off the rugby pitches. I see them growing up day by day and ache for time to stand still. I catch a glance in the mirror and notice the tell tale signs that I am into my fortieth year on this planet. I panic that time is passing by way too quickly. I struggle with the 6a.m. work alarms knowing that my priorities shift from family to work. I catch my breath at the thought of having to apply for secondary school places next year. I inwardly cringe at the times I used to moan at being a SAHM but would now return to that life in an instant. I want to take the batteries out of the ticking clock.